NATO troops leaving Afghanistan have left behind them a legacy of unexploded ordinance that is killing civilians at the rate of more than one a day, the majority of whom are children. Since first invading Afghanistan in 2001, NATO air forces have dropped 20,000 tons of bombs on the country. About 10 percent do not detonate on contact with the ground and some malfunction, the Guardian reports. Coalition soldiers have also set up firing ranges in dry riverbeds, fields and valleys, which are now scattered with unexploded shells and undetonated ammunition. Helmand is one of the worst-affected provinces, as well as shells and bombs there are 91 known minefields covering an area of 63.8 square kilometers. The UN-backed Mine Action Coordination Center of Afghanistan (Macca) recorded 369 casualties, including 89 deaths last year among the civilian Afghan population because of unexploded ordinance. In some cases, de-mining sappers themselves have been targeted directly by insurgents. It’s often children that bear the brunt of the mess coalition forces have left behind. Last fall, four siblings were collecting firewood near their home when shells that had been lying there unexploded went off in the children’s hands, killing two of them instantly and injuring their two brothers. The area had been used by US soldiers for battlefield training, but the area had not been marked. Macca says that 75 percent of victims from unexploded ordinance (UXO) are children, because in Afghanistan it is children who do a lot of the basic tasks, which put them in danger, such as herding animals and collecting firewood and scrap metal. The problem is compounded because most of the fighting in Afghanistan has taken place around residential areas. While diplomats from the US and the UK say that international law does not stipulate that countries clear battlefields, the director of Macca, Mohammad Sediq Rashid, says it doesn’t absolve NATO of responsibility. He said that scattering unexploded explosives around the country defeats the supposed object of the military intervention. “It is a moral responsibility. Military intervention is the last resort, and it’s intended to protect people and stabilize the country,” Rashid told The Guardian. Though there has been a reasonable amount of cooperation between NATO militaries and mine clearing agencies, there have also been complaints that in some cases US-led forces have withheld information about where UXO might lie. 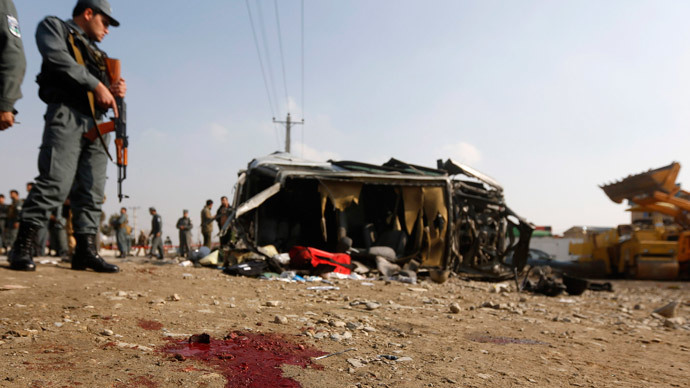 But after a peak in UXO accidents in 2013, and the subsequent critical media reports, Western governments have become more aware of the risks and are starting to cooperate more, according to Afghan officials. The problem is compounded because many areas of Afghanistan are still in conflict, although of a less intense nature, and the deadline for clearing all NATO former firing ranges by the end of 2015 may be delayed. In December 2014, insurgents killed 12 de-mining sappers in Helmand. Overall in 2014, 34 Macca personnel were killed and 27 injured carrying out their work.